It's done! All the calendars are gone, and we've distributed the funds! The purchase of this keepsake calendar benefited animal rescue. Read the Nugget Newspaper article for all the details and to learn more about these organizations. Due to the generosity of the advertisers who paid for printing (thank you! ), you all gave $6000 by purchasing this calendar to these organizations to help our animal pals: Deschutes County Sheriff's Office Livestock Rescue and Shelter which cares for neglected, abused, and abandoned livestock seized in abuse or neglect cases; Furry Friends Pet Food Drive, part of Kiwanis's holiday food drive; and Wild Wings Raptor Rehabilitation which treats, rehabilitates and returns injured or orphaned raptors to their natural habitat. View the images from the Calendar larger at Lynn's online photography gallery. Our Premier Party on August 30 at Bronco Billy's was a fabulous time! What a fine celebration! Read the Nugget News article about the Calendar's Release. 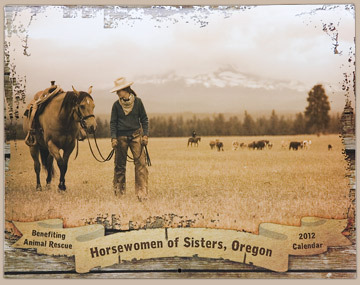 September 7, 2011: We are so pleased to report that sales of the calendar are already going gangbusters! Folks are commending us on how wonderful it looks and how much fun it is to look through and read! Many are buying dozens of copies as gifts. We will have numbers to report here at the end of each month, but estimate that 300-400 have sold so far! Get yours quick! end of November: All 800 calendars have sold out! I have heard that there may be a handful left at a couple of the stores in the list below, but few and far between! December 2, 2011: The calendars have sold out! We have collected all the funds generated by the calendar — including the donations many people gave on top of the asking price (thank you! ), and we'll be presenting the funds to the organizations in early January! January 24, 2012: We've distributed the checks! See the Nugget Newspaper's article for more details on the organizations and the finale of the calendar project. Calendars are no longer available; we sold out! About 10 stores in Sisters, as well as a couple in Redmond & Bend. Contact Lynn Woodward about the photography: by email, or phone, 541.771.7788. Separate from the calendar sales, prints from the calendar and out takes of the shoots are in Lynn's online photography gallery. The crew who thought up this idea — Darlene, Patty, Carol & Susan — of course, spent much more time than they ever dreamed on this project. And, we have much more fun than we had imagined, as well. Nothing could have happened, except that so many people said yes without hesitation. View the images from the Calendar larger at Lynn's online photography gallery. Photographic prints from the calendar are (and out takes will be) in the large-photo gallery.